Communications from staff included an update on the Argo Dam bypass, where work has stopped for the season. Additional work, including paving of a footpath, will occur in the spring. And in communications from commissioners, Sam Offen reminded his colleagues of the upcoming sustainability forums. The first forum is on Thursday, Jan. 12, focusing on resource management. All forums, held once a month, will be at the downtown Ann Arbor District Library building, 343 S. Fifth Ave. starting at 7 p.m.
Jason Tallant, a staff member of the city’s natural area preservation program, gave a presentation about the work that NAP does. He began by noting NAP’s mission: “To protect and restore Ann Arbor’s natural areas and foster an environmental ethic among its citizens.” It’s something he had to recite when he first started working at NAP, Tallant said, and something the staff regularly evokes. NAP tracks volunteer hours by the type of work that volunteers do, Tallant said, and has tracked that data going back to 1994 – the year after the current NAP manager, David Borneman, was hired. Since about 2007, the program has courted private groups to volunteer, from nonprofits like SOS Community Services to companies like Toyota. The number of hours in that category grew from 1,613 in 2007 to 5,031 in 2011. The next-highest category of volunteer hours is logged during public workdays, with 1,464 hours in 2011. Tallant credited former NAP volunteer coordinator Jason Frenzel with expanding the private group volunteer effort. The work days often include several hundred people, like the more than 400 Community High School students who volunteered at eight different parks in one day this past year. Tallant said that NAP’s field crew, which he supervises, has spent most of this fall following up on work that was started during volunteer work days over the summer. Controlled burning is the primary task that NAP performs for ecological restoration to achieve the greatest results, Tallant said. But in term of hours spent by staff or volunteers, it’s a small percentage compared to other tasks – 343 hours in 2011, out of a total of 11,869 volunteer hours. Volunteers spend most of their time doing invasive species control, he said, logging 4,737 hours on that task. Other tasks include trail work (2,748 hours), administrative work (659 hours), revegetation (561 hours) inventory and monitoring of animals and plants (594 hours), stewardship training (118 hours), and trash pick-up (98 hours). This past burn season was the wettest one on record, Tallant noted. Even so, NAP workers did controlled burns on 72 acres over eight days. Two percent of that land was on rain gardens, reflecting the fact that NAP has started to take over maintenance of the city’s rain gardens, he said. Other burns occurred in woodland (45%), prairies/old fields (19%), savanna/prairies (18%), and wet prairies (16%). PAC chair Julie Grand asked about the transition for managing volunteers. Jason Frenzel, the former NAP volunteer coordinator, left that job earlier this year to join the Huron River Watershed Council. David Borneman, NAP’s manager, noted that Frenzel had worked with the city in that position for about eight years. It was a Teamster job, but it hasn’t been filled, he said. They’re taking a step back and looking at the broader organization, Borneman said, to decide how to handle that work. Gwen Nystuen noted that in addition to NAP volunteers, the rest of the parks system also uses volunteers – for the adopt-a-park program, as one example. Colin Smith, the city’s parks and recreation manager, said the staff is looking at how to coordinate volunteers for all the programs, including NAP. Gayle Hurn is volunteer outreach coordinator for the overall parks system. Borneman added that there’s a recognition for greater consistency across all areas regarding volunteer outreach. Jen Lawson, the city’s water quality manager, gave a presentation on a streambank stabilization project at Leslie Park, where one of the city’s two golf courses is located. The Traver Creek bank is exhibiting some erosion, as any urban stream would, she said. 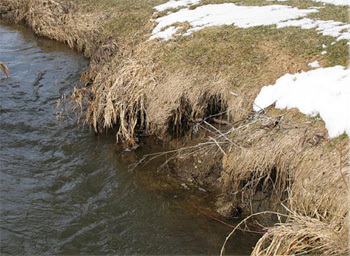 High volumes of sediment are being swept away, deposited downstream and into the Huron River. The vegetation along that stretch of the creek is golf course turf grass, which provides a limited buffer between the land and the creek. As a result, there are areas along the creek that experience regular flooding, Lawson said. The project has three goals, she said: (1) improving stormwater quality, because the creek is incorporated into the city’s stormwater system; (2) improving several ecological aspects, such as reducing phosphorus that’s discharged into the river, and enhancing the habitat for wildlife; and (3) improving the recreational experience for golfers. Addressing bank erosion and reducing the phosphorus load in Traver Creek, a tributary to the Huron River. Assessing hydrologic, hydraulic and geomorphic conditions to develop appropriate stabilization measures. Possibly retrofitting the downstream basin and upstream irrigation pond, which might involve moving the pump station. This might help with the limited detention of small flooding events. Soliciting ideas for additional stormwater treatment. The city hopes to hire a design consultant in January, with preliminary designs for the project ready by April. Final designs and construction plans would be done by July, and construction is projected to start in November of 2012. The project would be completed by the spring of 2013, Lawson said, although there would be an additional two-year growing season for plants to take hold. A photo included in the park advisory commission meeting information packet shows a section of the Traver Creek bank that's been eroded as it runs through the Leslie Park golf course. The construction will occur in two phases, she said. The first phase, which involves heavy equipment and moving dirt, will take place during the winter when the ground is frozen, to minimize impact from construction runoff. The second phase entails planting grasses, sedges, perennials, wildflowers and other plants. Because this is a stormwater infrastructure project, Lawson said, the city can use the state’s revolving loan fund, via Washtenaw County’s office of the water resources commissioner. There’s the potential for up to 50% loan forgiveness, if the city can show that it’s a “green” project, she said. Gwen Nystuen asked if it would be easier to see the creek, after the project is completed. Yes, Lawson said. None of the plantings will grow tall, except in the areas where no golf is played. Colin Smith, manager of parks & rec, said there’s good collaboration and an understanding of what’s needed in terms of revenues and recreational access at the golf course. He noted that Lawson has worked on this type of project at her previous job, with success. Lawson explained that the project she’d previously done was for a municipal golf course in Troy, which was also in an urban watershed. It’s important to meld the two types of land uses together, she said. In response to a question from Sam Offen, Smith said the work will be staggered in stages, so that areas of the course that get the most play will be done first. That way, those areas will be ready when the season resumes in the spring of 2013. It’s obvious that they need to be extremely aware of the impact on golf revenues, Smith said. The intent is not to halt golf play at all, Lawson added. Tim Berla noted that several years ago, a project at Mary Beth Doyle Park aimed to stabilize the stormwater flow and sediment going into Malletts Creek. The project had been designed so that earth-moving equipment could come in every few years to remove the sediment. He wondered if sediment that was collected in the wetlands there was being removed, and whether the same kind of removal would be needed along Traver Creek, too. Lawson said the county is monitoring the amount of sediment at Mary Beth Doyle Park. No sediment has been removed yet, she said, but when it needs to happen, the county would handle it. For the Leslie Park golf course project, she said they aren’t yet sure how it will be designed. There’s some desire to take the stormwater retention ponds “offline” – that is, to design the ponds so that the creek doesn’t flow through them. Whenever there’s an impoundment, like a pond, the water flow slows and sediment settles out. The common solution is to have ponds there for stormwater control, she said. But the state Department of Environmental Quality (MDEQ) prefers to have an open creek, which is better from a habitat perspective. The project’s ultimate design needs to take into account the hydrology of the site, Lawson said, and the multiple uses of the ponds – for sediment capture and stormwater control. Tim Doyle asked for clarification about the location of the project. Lawson said it would run from where the creek crosses Traver Road to the south, to where it crosses Traver Road again to the north. Every meeting includes opportunities for staff and commissioners to give updates or share information. 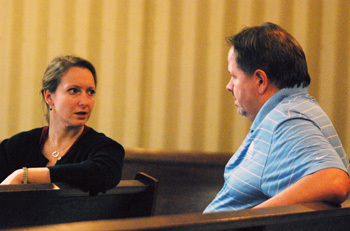 Colin Smith, the city’s parks and recreation manager, gave updates on several projects. He noted that the Olson dog park would be closed during the week of Dec. 26 for drainage work. Drain tiles will be installed to make it “less of a muddy mess” than it’s been in the past, he said. The dog park – part of Olson Park, which is located off of Dhu Varren Road on the city’s north side – is expected to reopen on Jan. 2. 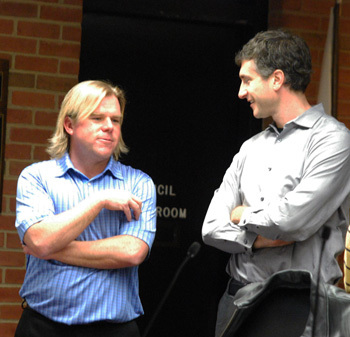 From left: Colin Smith, Ann Arbor's parks & rec manager, and city councilmember Christopher Taylor (Ward 3), who also serves as an ex officio member of the city's park advisory commission. Smith reported that work for the season has wrapped up at the Argo Dam bypass. Some additional work will be done in the spring on the spillway, he said, to calibrate the water flow. Paving of the paths along the bypass will also happen in April or May, though the path will be open throughout the winter. And the new bridge, which will be built where the concrete culvert is currently located, will also be installed in the spring. John Lawter asked for an update on the whitewater area, which will be built in the Huron River near the bypass. DTE agreed to pay for the whitewater section – the utility is being required by the state to complete environmental remediation on its nearby property, which prompted its request that the city hold off on the part of the project that runs along the river. Smith said the city was still waiting to receive a copy of DTE’s remediation plan, but he noted that as he had reported at the November PAC meeting, DTE will now be paying for the whitewater part of the project. Tim Berla wondered what the status would be of the land along the river that DTE is remediating. He thought it should be a park with a bandshell, and perhaps some commercial operations. He asked what the process would be for deciding what happens to that parcel. Smith said that if the land came to the city, there would be a public process for deciding what happens to it. In several of the city’s master plans, there are references about possible uses for the site, he said. But all of that depends on whether the city owns the land, he noted. Currently, it is DTE property. Sam Offen asked whether there would be any other changes at Argo and Gallup canoe liveries, as a result of this project. Parks staff will spend the winter months working out those details, Smith replied. They had always expected to add amenities like inner-tubing and rafts, he said. They’ll also likely be purchasing a new type of kayak that’s better suited for the bypass, since there will likely be more “banging around” as people navigate the descending pools. David Barrett noted that canoes and kayaks will no longer be banged up because of being hauled down stairs, as they had to be with the previous portage. Smith said the staff will also work on developing a new guide for river tours, since there are now more options. They’ll likely bring something to PAC to review, and plan a grand opening in May or June for the public. Tim Doyle asked whether there was any concern about congestion in the new bypass. Smith said congestion was an issue with the previous configuration, whenever it was busy. The challenge is to ensure that people know that there are different options, he said, and that they take the trip that best suits them. Later in his report, Smith also noted that the city had received two state grants earlier in the month: $300,000 for a proposed Ann Arbor skatepark at Veterans Memorial Park, and $300,000 for improvements at the Gallup Park canoe livery. The grants were awarded by the Michigan Natural Resources Trust Fund. For the skatepark, city parks staff would be meeting with skatepark organizers to talk about next steps, Smith said. It’s likely that a request for proposals (RFP) will be issued for a design/build, he said. When asked by Sam Offen to clarify, Smith said a design/build RFP would ask for bids that include both the skatepark’s design as well as its construction, in a single proposal. It’s similar to the RFP for the Argo Dam bypass, he said. Tim Berla, who’s also a member of the city’s recreation advisory commission (RAC), reported that Ann Arbor Rec & Ed will hold a fitness fair on Thursday, Jan. 12 from 5:30 to 7:30 p.m. at Forsythe Middle School, 1655 Newport Road. The event will include a keynote speech by Pete Thomas, a local resident who was on Season 2 of the TV show The Biggest Loser. 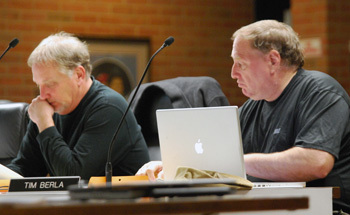 From left: John Lawter and Tim Berla of the Ann Arbor park advisory commission. Berla said that at the last RAC meeting, commissioners learned that the Rec & Ed budget is still “iffy.” Rec & Ed is a program of the Ann Arbor Public Schools, and Berla said the program has cut costs to address its budget, including moving its offices to Pioneer High School, where they don’t have to pay rent. Berla said Rec & Ed didn’t raise prices for its offerings this year because the market is so competitive, but that means its margins are small, he said. Berla also reported that Rec & Ed staff are pleased that the city’s softball and baseball diamonds will be renovated – leagues from Rec & Ed use the city’s ball diamonds, as well as ball diamonds that are owned by AAPS. Sam Offen reminded commissioners about the upcoming sustainability forums, starting in January. All forums will be held at the downtown Ann Arbor District Library building, 343 S. Fifth Ave. starting at 7 p.m.
Sam Offen also reported that a new executive director has been hired for the Leslie Science & Nature Center – Offen serves on the center’s board of directors. Until 2007, the nonprofit had been part of the city’s parks system, and the city continues to own the center’s property and buildings. Susan Westhoff joined the center as executive director earlier this year, following the resignation of Greta Brunschwyler, who had served in that role since early 2010. Offen said he hoped to set up a time for Westhoff to attend an upcoming PAC meeting so that other commissioners could meet her. Present: David Barrett, Tim Berla, Doug Chapman, Tim Doyle, Julie Grand, John Lawter, Karen Levin, Gwen Nystuen, Sam Offen, councilmember Christopher Taylor (ex-officio). Also Colin Smith, city parks manager. Absent: Councilmember Mike Anglin (ex-officio). The Chronicle survives in part through regular voluntary subscriptions to support our coverage of public bodies like the Ann Arbor park advisory commission. If you’re already supporting The Chronicle, please encourage your friends, neighbors and coworkers to do the same. Click this link for details: Subscribe to The Chronicle. I thought the skate park already had a design. Weren’t there some meetings with a famed skate park designer at Slauson, for example? That section of creek is microcosm of how a natural river flows – with twists and turns, oxbows, little oxbow lakes, and islands. I really hope they’re not thinking of straightening and channelizing this section – esp. if Leslie Golf Course is seeking to become a ‘greener’ golf course. I also doubt that much sediment from this section of river is making it to the Huron River. There’s an impoundment just before Traver Rd. that would trap that sediment. Any ideas on what’s being proposed?